One of the topics we like to revisit time and time again is our calculation of the inflation, measured in CPI, that the market is expecting over various timeframes. We most recently looked at inflation expectations at the end of August, and noted a recent uptick. In fact, you don’t even have to wait for our updates to get a quick gauge of the readings – we built an inflation breakeven calculator some time back which does the math for you. But What If The Market Doesn’t Know? Well, conceptually, the point of the breakevens isn’t so much to say that “this is definitively going to be the path forward for inflation” so much as “this is the inflation reading which means neither non-inflation nor inflation protected securities had the advantage in return”. There are many reasons you might pick Treasury Notes over, say, TIPS – and many of them have nothing to do with inflation. Ease of use, understanding, liquidity preferences, holding requirements, even tax treatment and type of account you hold securities in is going to make a difference in what you pick. Think of inflation expectations with all those little inaccuracies like those “electrical body fat percentage” scales, which are notoriously inaccurate. Sure, they’re inaccurate – but directionally, if you measure around the same time of day in similar conditions… you’ll see a trend. Likewise, if the market is pricing in 3% inflation over the next five years when yesterday it was pricing in 2% inflation? Yeah, something significant happened. 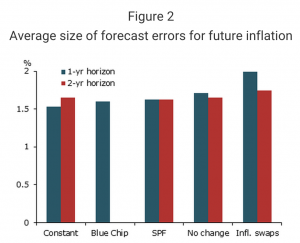 The San Francisco Federal Reserve recently released a report on the accuracy of inflation forecasts – finding, perhaps hilariously, that just projecting a flat constant inflation rate out into the future was the best method of predicting inflation in a year or two. And, yes, market forecasters were more accurate than the ‘market’ at large – at least judging by inflation swaps (there wasn’t really enough data using the TIPs method we use – maybe DQYDJ can pick up the cause?). Even just projecting the current inflation out a year was better… but see for yourself. Okay, so there isn’t a ton of history to compare inflation expectations with… but already, expectations don’t seem to line up too perfectly with reality, especially when there are other methods of forecasting inflation. But here’s the important thing – yes, the majority of you should still be passively investing in an age-appropriate fashion. However, if you do choose to go the individual investment route, you better have an eye on inflation. Hopefully this article helps you decide what, exactly, you’ll be looking at! Since my crystal ball is broken, I’ve always figured in my forecasting (whether for inflation or market returns) that it’s better to be a little off in a way that doesn’t favor me (or my clients), e.g. a slightly higher inflation and a slightly lower return. If the forecasts turn out to be wrong and the world ends up better than we had predicted, then you can either retire earlier or have a more robust lifestyle in retirement. Not a bad problem to have. And, +1(000000) to the idea that most people should be investing in passive, low cost index funds. Well played, sir. Send me some of those crystal ball fragments, I’ll try to piece it back together? I hear you – better to be off to the upside. Having too much in reserve is a better situation than the reverse. average return 8.5%ish so where is sp 500 today and how far off the average is it there is an expected return over or under the longer trend It depends it depends it depends 5.77% div and earnings growth 25 year average, lower dividend and lower payout ratio, share repurchases seem to give the appearance of growth when gdp is sluggish and may be for 20 more years, who knows there is no baby boom going on as of today.